Nose: Malty and mildly fruity (citrus, melon) along with some pepper and light hints of mocha. Not particularly sherried. With a little more time the fruit expands and gets more acidic, and now there are mild notes of toffee and raisins as well. With even more time some toasted wood peeks out as well. With a drop of water the malt and fruit make a big integrated comeback. Palate: Very much as on the nose: malty and fruity with light hints of mocha and tasted wood. As on the nose, it’s not overtly sherried with mild rum-raisin notes and a hint of toffee the chief nods at the cask. Gets a little grassy as it goes. With water the fruit gets brighter. Finish: Medium. More citrussy on the way out but there’s also something mildly soapy and bitter at the very end. Water gets rid of the soapy/bitter thing. 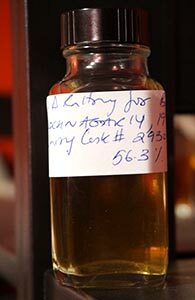 Comments: A decent whisky which probably owes its character more to the type of wood (I’d guess American oak) the cask was made from than from its previous contents. Nothing earthshaking here and apart from the slight soapiness on the finish at first, no real flaws. Better with water.